1st Halter & JC Best Brightness - Fleece! 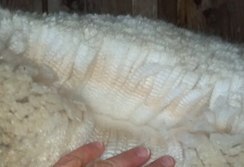 Awesome yearling fleece - incredibly dense & buttery soft! This full Peruvian, 3/8 Accoyo girl was a beauty from birth, and hit the ground running on the AOBA show circuit! Awarded her first blue ribbon at only 6 months of age and as the youngest in her large class at the 2006 MAPACA Jubilee, Grande Alera also garnered a decisive first place just two weeks later at the 2006 PAOBA Breeders Showcase, followed by a second place at the AOBA National Conference - all before the age of 7 months. Taddeo is ABSOLUTELY AWESOME and has just gotten better and better with time! We are obsessed with the fleece of this young herdsire who was a RESERVE CHAMPION in white at 9 months, 15 months, and 21 months, and who is now a halter COLOR CHAMPION and MAPACA Fleece JUDGES' CHOICE winner! Taddeo's fleece is GORGEOUS with great density, exquisite architecture, small bundles, and a buttery, soft hand that I can't stop touching and looking at nightly! "Taddeo" means "praised" and "desired" and he does his moniker proud. 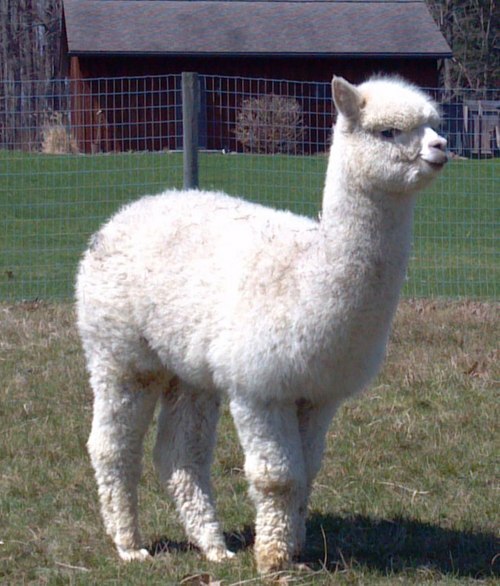 Taddeo's first cria, Morning SKY's Taddeo's Piccolo, is square, incredibly dense, and has volumes of bright white fleece with teeny, tiny bundles that earned her a 2nd place at the 2016 Buckeye Alpaca Show, standing over the cria of a high ticket herdsire. His subsequent crias are also beauties - and female! Morning SKY's Elena placed 3rd at the 2016 AOA National Show. This handsome male is sired by multiple Champion, Alpaca Palace's Houdini, and his dam, Morning SKY's Grande Alera, is a multiple ribbon winner by Grand Alero, a 3/4 Accoyo Grand Master son. The combination of these genetics is what gives Taddeo such tremendous density, consistent and exceptional fleece character from topknot to tail to toe, soft handle and strong conformation. Taddeo was awarded his FIRST RESERVE CHAMPION banner at 9 months of age and his SECOND RESERVE banner at the 2012 MABA Alpaca Celebration in another large class! (Color went to a 6 year old male.) 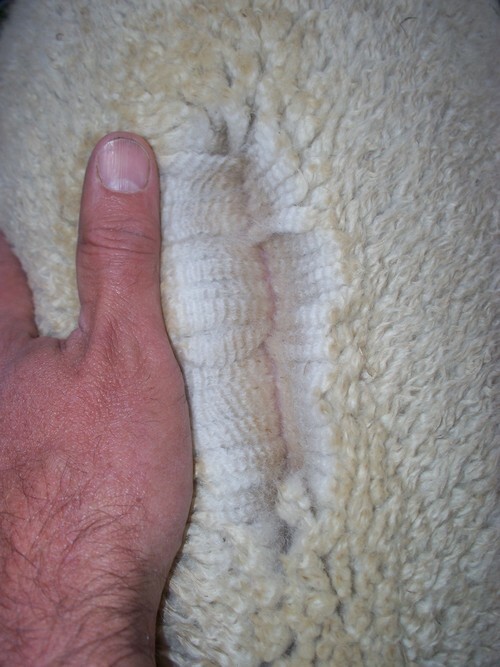 This male has fineness, density, a buttery handle to his fleece and gorgeous crimp. 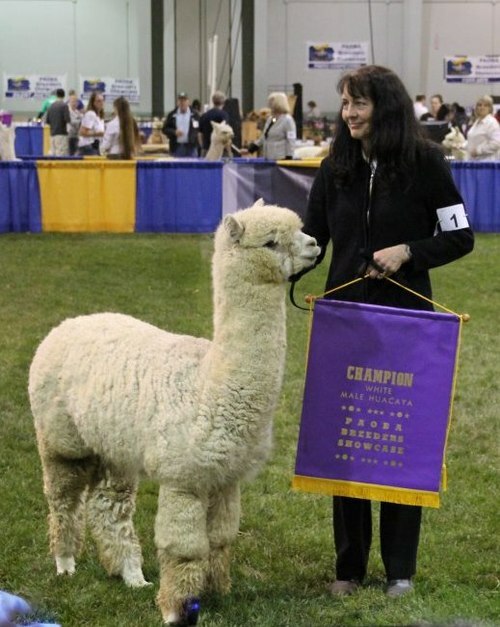 A THIRD RESERVE CHAMPION banner was awarded to Taddeo at the 2013 Buckeye Alpaca Show, along with WINNING the JUNIOR HERDSIRE class where the three judges called his fleece "gorgeous, gorgeous, gorgeous!" 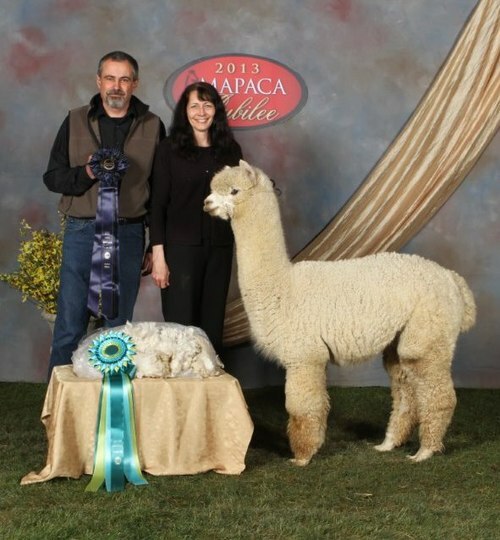 JUDGES' CHOICE in the large 2013 MAPACA fleece show for Best Brightness; his dam, Alera, won the same award in 2007! 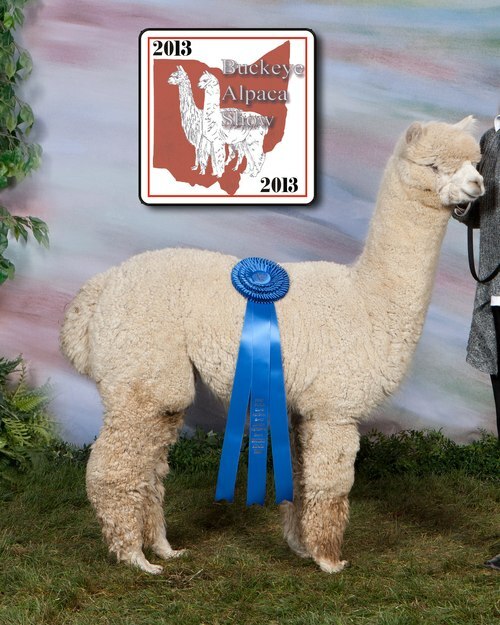 Taddeo also placed 1st in his large halter class at the 2013 MAPACA Jubilee. Taddeo also garnered a 2nd place ribbon at the 2015 AOA National Fleece Conference with his third fleece. Pin him to your "Herdsires to Use" Pinterest board and contact Morning SKY Farm to book a breeding!